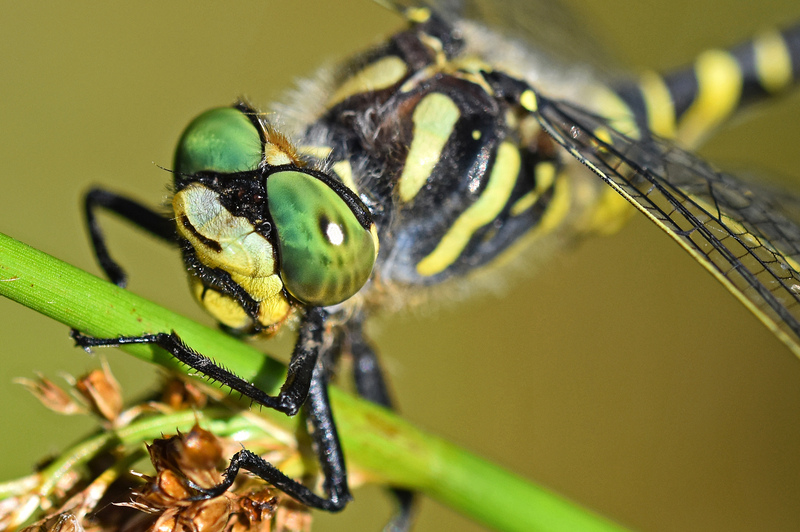 Anyone who has ever sat and watched dragonflies flying over a pond; turning back and forth and darting up to investigate an intruder, will not be surprised to learn that they have extraordinarily good eyesight, probably better than any other insect. Just as well perhaps, as they have a very poor sense of smell and hearing! They really do rely on their vision; for finding mates, catching prey, fighting and defending territories, if they have them. Colours are also vitally important in their world, for recognising their own species, mates, juveniles, different morphs and so on. 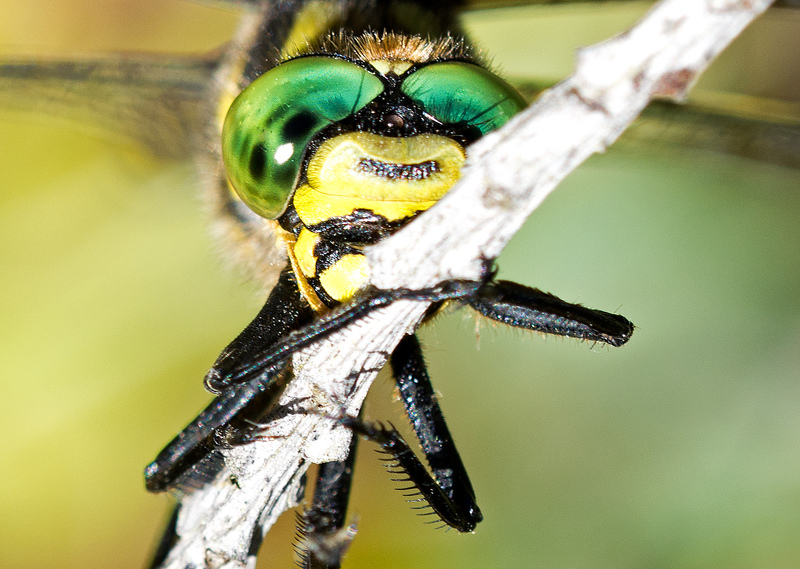 Most dragonflies are superbly coloured, even to our rather humble human eyes! 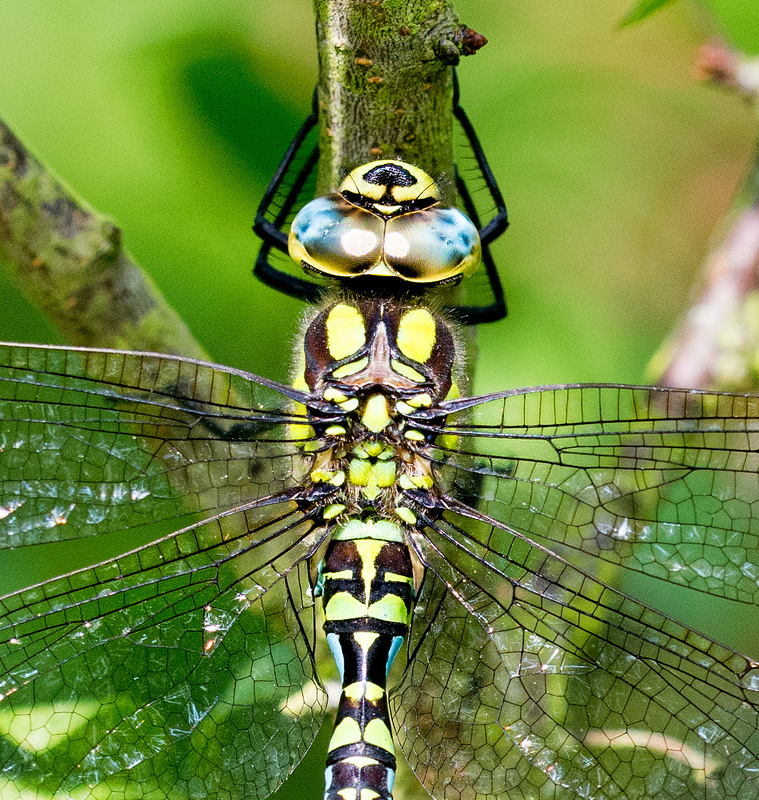 We are blessed with many gorgeously coloured dragonflies in the UK, including the Southern Hawker (below). The quality and nature of vision in animals is related to the diversity of opsin proteins that they have in their eyes. We humans like to think that our eyesight is pretty good, and thanks to our large brains it is, but we rely on just three opsin genes, which means that we have three photoreceptors (cones), sensitive to blue, green and red light. So we can see across a colour spectrum from red to violet, but not ultraviolet (UV). If I now mention that dragonflies have between fifteen and 33 opsin genes, that gives some idea of just how good their vision may be! Some of these opsins may be non-visual proteins, but they still have large numbers of visual opsins, including ones for for short-wavelength (SW), long wavelength (LW) and UV light. 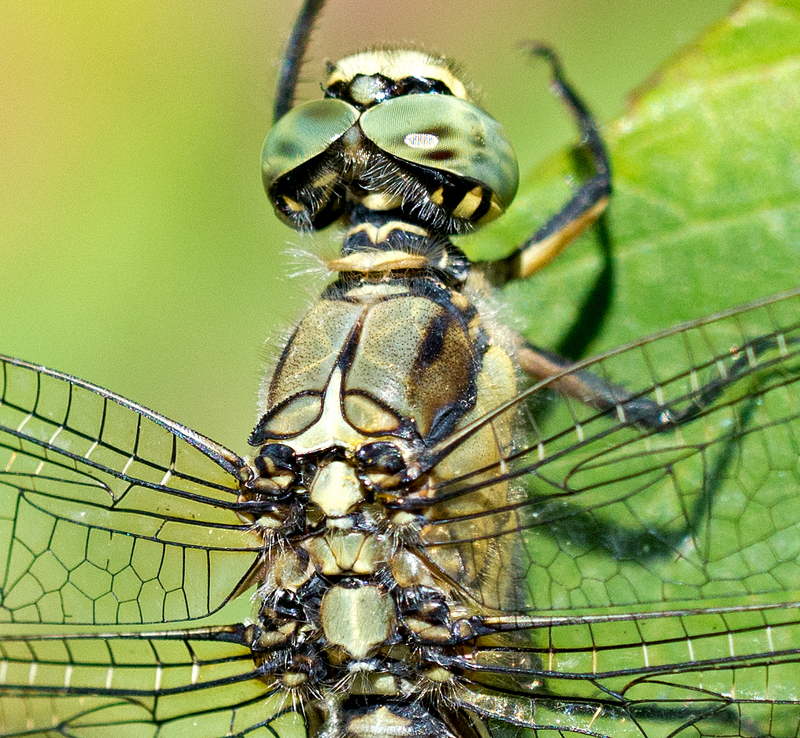 The large compound eyes of dragonflies are divided into two regions: a dorsal (upper) region, which detects SW light directly from the sky above; and a ventral (under) region, which picks up light reflected off objects on the ground. Compound eyes are composed of many tiny little facets or ommatidia. Amazingly, there are up to 30,000 of these little lenses in a dragonfly eye. There are also some small ocelli in the middle of the head; the largest one is marked with an arrow in the following photograph. Remarkably, dragonflies use these as a sort of horizon detector, in order to ensure that they are correctly positioned or oriented! Scarlet Grenadier (Lathrecista asiatica) female. Median ocellus marked. 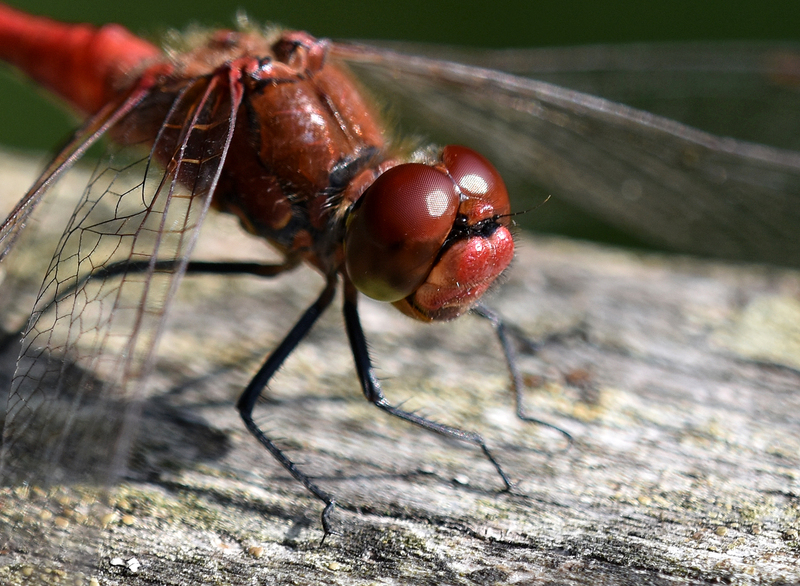 The dorsal eyes of Sympetrum (below), and other dragonflies, contain yellow screening pigments in combination with a very high frequency of blue receptors, as well as a fovea – a region with very sharp vision – for tracking fast-moving prey against the bright blue sky. It is thought that the sky appears to be very bright to a dragonfly. 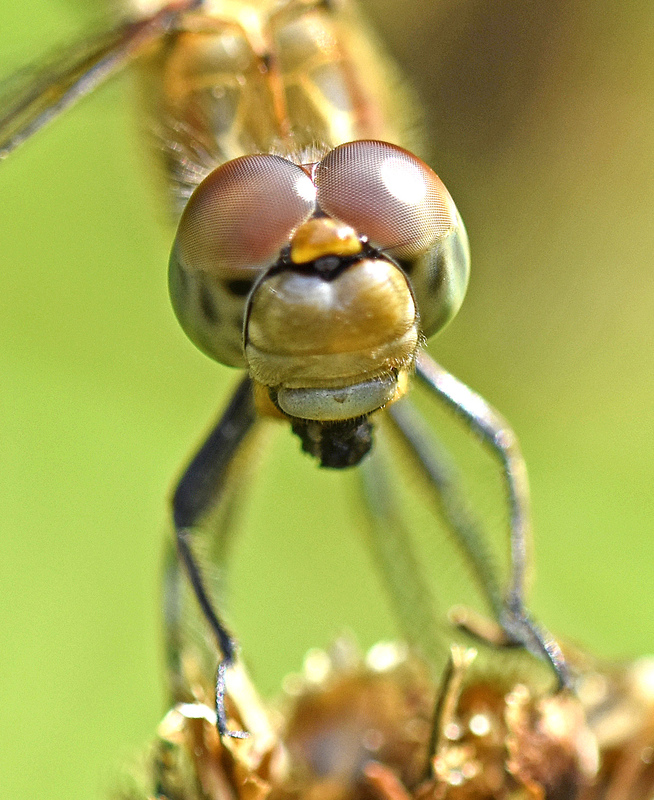 There is a pronounced division of the compound eye in dragonflies – including Sympetrum species (below) – into dorsal and ventral regions. The upper (dorsal) portion of the compound eyes part is exclusively sensitive to short wavelength light and contains mainly blue-receptors, plus a smaller amount of UV-receptors. 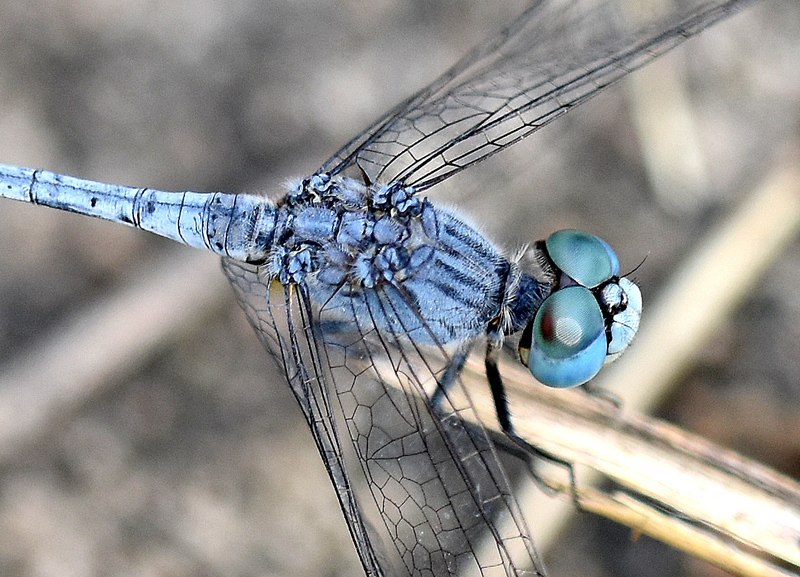 It is also obvious that dragonflies have terrific ‘wrap-around’ eyes (below), which means that can see in virtually all directions at the same time. Think about it, they can see you directly in front of them as the fly towards you, from the side of the eye as they fly past, and from the back of the eyes once they have flown past! The backwards vision is probably not as good as the forward vision – the dorso-frontal regions have enlarged ommatidia – but still, they really do have eyes in the back of their heads! Berry, Richard P. et al. (200&). Form vision in the insect dorsal ocelli: An anatomical and optical analysis of the dragonfly median ocellus. Vision Research 47, 1394-1409. Futahashi, R. (2016). 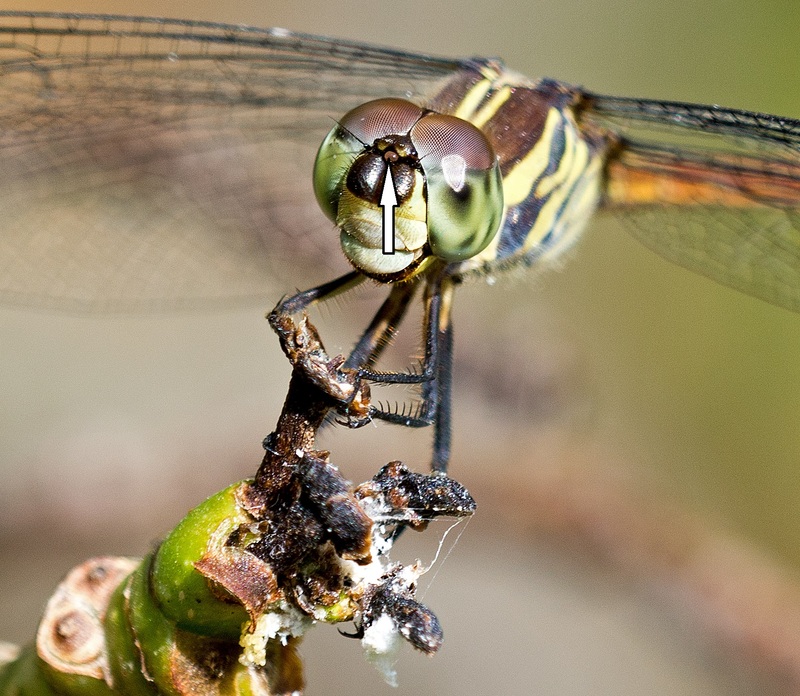 Color vision and color formation in dragonflies. Current Opinion in Insect Science, 17, 32-39. Futahashi, R., Kawahara-Miki, R., Kinoshita, M., Yoshitake, K., Yajima, S., Arikawa, K. and Fukatsu, T., 2015. Extraordinary diversity of visual opsin genes in dragonflies. Proceedings of the National Academy of Sciences, 112(11), pp.E1247-E1256. Labhart T, Nilsson DE. (1995). 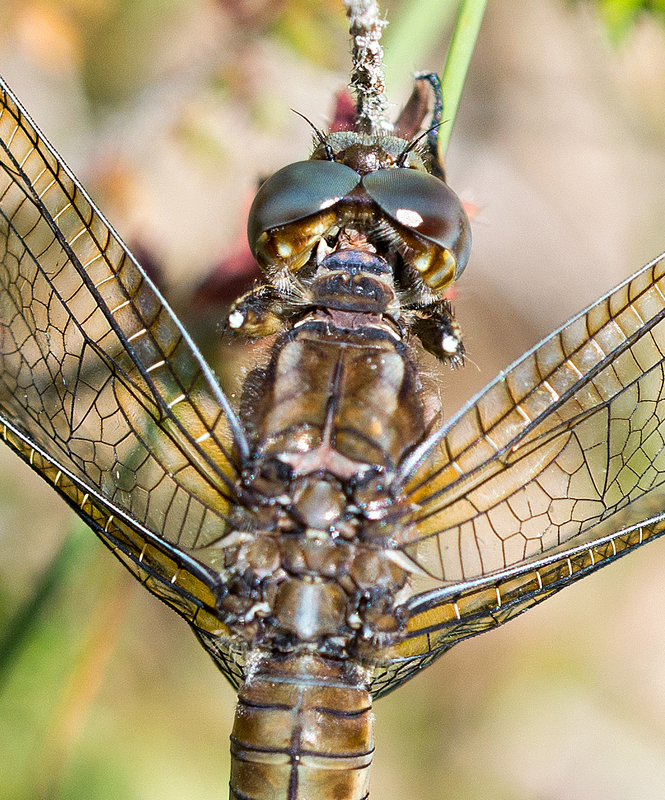 The dorsal eye of the dragonfly Sympetrum: specializations for prey detection against the blue sky. J. Comp. Physiol. A., 176:437–453. Next Next post: How to build a butterfly! Thank you for interesting info and photos. Amazing how they can keep going like that all day, with the odd rest!